The Internet of Things (IoT), sensors and connected devices are all the buzz leading up to DistribuTECH (Feb 9-11), so I sat down with one of our IoT specialists, Lorry Hardt to learn more. Lorry will be at DistribuTECH to support our joint demonstration with Intel and gave me the inside scoop on what he's planning to showcase at the conference. First off, what “sensors” are you taking to the conference? Lorry: You can think of the sensor as a low-cost computer that can be programmed. The device looks like a circuit board, but we used a 3-D printer to make a durable case so that we can easily transport it without affecting the wiring inside. In the education world, these “development boards” may be found inside a middle school robot, or a high school science project about synthesizers. Because of their flexibility and low-cost, companies use them in lots of different ways. We chose to use this device as our sensor, which collects and aggregates multiple environmental readings (temp, humidity, light, motion and sound). Our partner, Intel, provides an Arduino-compatible board called Galileo. What data do the sensors provide to the Intel IoT Gateway? The data is sent in real time from the sensor to the Intel IOT Gateway. Once the data is in the Gateway, it's available to other wireless devices for access and analysis. In this scenario, we use the data for a dynamic building occupancy model for demand response and energy efficiency program managers. The model gives detailed insight into the function of the building -- and opportunities for improvement. What is the role of the Gateway in an IoT infrastructure? Lorry: The main role is connecting legacy systems/industrial devices to the IoT. With these gateways, companies can augment their existing IT infrastructure. This new data stream gives new insights into areas that most likely will improve operational efficiency. Now, these IoT gateways are not just a networking device – you can also think of them as small computers. 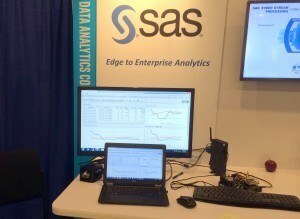 By installing sophisticated software like SAS Event Stream Processing, you can develop real-time analytics on the edge. For example, you can build a predictive model that could alert a user of a potential failure of a system or piece of equipment. You could then take immediate action, and hopefully fix the problem before it even starts. Working together, Intel Gateways and SAS analytics make IoT systems smarter as more data is passed through. With machine learning capabilities, each model becomes better and better as more data history is captured. Where else have you been with this sensor and gateway demonstration? Lorry: We've been to the Intel IDF conference, Strata, Gartner BI Summit, SAS Analytics 2015, and the Hadoop Summit 2015. Have you seen an evolution in the Internet of Things in the past year? What lies ahead for 2016? Lorry: I see progress primarily in the code that supports streaming all of this data to different platforms and storage locations (such as the cloud). And there will always be steady progress in the networking system that connects IoT devices. In 2016, I think more people will buy and install sensors (like Nest thermostats) in their homes. Just a year ago, that might have sounded strange or hard to implement. The documentation for connecting these devices and platforms is good and only getting better. 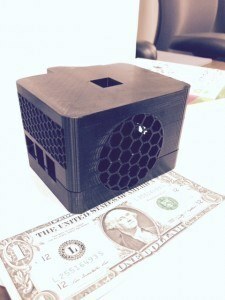 And that supports the market data for current and forecasted spending related to IoT. According to IDC, $7 Trillion USD is expected to be invested in IoT solutions in the next 5 years. Can you give me an example of how an organization would use analytics on the edge? What type of analytics are most common? And for what business purpose? I've seen two scenarios that depend on edge analytics. The first is smart data filtering where there are network capacity or cost issues. Some device sensors produce a large amount of data, even when nothing interesting is going on. In the case of a remote device or a connected car, the network may be provided through a cellular data connection. It doesn’t make sense to send all the raw data measurements to the cloud when you really just want the interesting results. Using “analytics on the edge” for smart data filtering allows you to send only the interesting results and safely ignore or summarize the normal operations for later batch transmission. The other scenario is when you want to provide fast real-time feedback to the edge device. By doing the analytics on the edge device itself, you can provide immediate feedback to any controllers or other consumers on the device. You won’t incur the delay of sending the raw data to the cloud and waiting for the response to be returned. Common analytics on the edge includes forecasts, predictive algorithms, data mining models, and recommendation models. These can be used for failure detection and event isolation, or customer next best offer real-time marketing campaigns. What do you hope to accomplish at DistribuTECH? Lorry: I really want attendees to understand the concept of analytics on the edge. SAS and Intel are taking the IoT concept to the next level by enabling multi-phase analytics on Intel’s architecture, both at the edge and in the data center. We're going beyond just connecting information; we're understanding and explaining those interactions in real time, predicting what things should look like in the future and what actions you should take. And it's all done with our multi-phase approach to analytics and the power of the Intel architecture as the platform for our in-memory capabilities.